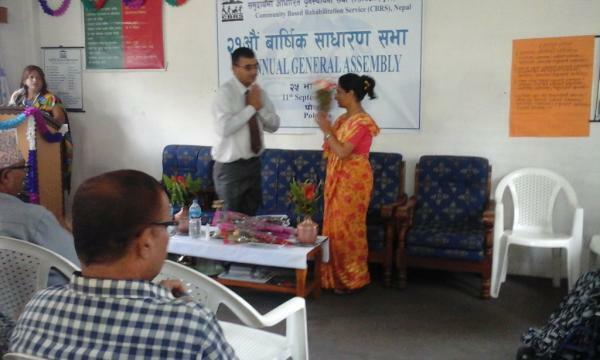 Community Based Rehabilitation Service (CBRS), Nepal 21th Annual General Assembly Meeting (AGM) 2072/05/25(Friday, 11 September 2015) CBRS Nepal, Pokhara 21th AGM opening session welcoming photos Community Based Rehabilitation Service (CBRS) was founded in 1995 in Pokhara, Nepal as a non-profit making social organization working for and with disabled people, their families and the community. It is well established, transparent and continually working for physical rehabilitation as well as promoting self-reliant and dignified lives for children and young adults with disabilities, the poor and the marginalized sectors of society through sustainable livelihood training, inclusive education, lobbying, advocacy, and social inclusion. Currently, CBRS works in three Districts of West Nepal: Kaski, Syangja and Tanahun. The field programme area comprises: twenty-nine Village Development Committees and two Municipalities in Kaski district, twenty-four Village Development Committees and two Municipalities in Shyangja district, and one Municipality and 3 Village Development Committees in Tanahun district. People with disabilities and those marginalized by society from outside these areas can attend a weekly counseling day, available in all field offices. The Annual General Assembly Meeting (AGM) is a public forum for the open discussion and social audit of the activities and financial for the last 12 months. 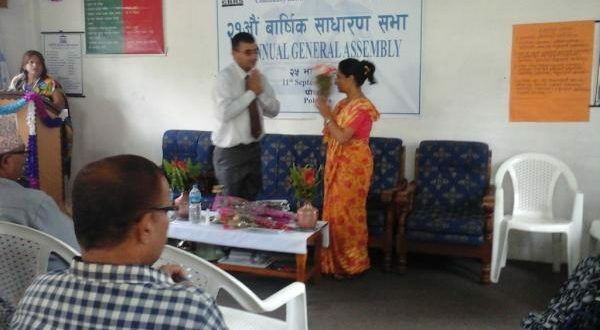 The 21th AGM was held on 2072/05/25(11th September 2015) in the CBRS office in Pokhara. There was very encouraging attendance by rights holders, networking organizations, government organizations, media persons, journalists, CBRS general members and staff. The meeting was held in two parts, an open session/public assembly and a closed session. The chief guest for the opening session was MS Samjhana Sharma, Director of Human Rights Commissions of the Western Regional office, Pokhara. In this very encouraging part of the meeting more than 80 people took part in welcome speeches, children’s performed a welcome song, One boy Mr. … was honored on his successful pass out of school living certificate, three children and their parents were honored who are running a successful income generation activities i.e. chicken rearing, fruit shop and vegetable shop. At the mean time annual progress report and financial report, and action plan for the coming year was also presented to the public audience. All the presentations were much appreciated by the attendees. The close session followed, during which the narrative report, financial report, and revised laws and policy were presented by the General Secretary and Treasurer respectively, and were approved with amend by the AGM with comments. The meeting also approved the next year’s tentative programme and budgets, and also appointed the CBRS external financial auditor – Prof. Dr. Mr. Beth Nath Sharma from B.N. and Sharma Company Ltd. Finally, the assembly expressed its heartfelt thanks to all the rights holders, staff members, donor organizations and individuals for their part in helping us meet this level of success and achievement.